Director: Patrik Syversen / Writers: Patrik Syversen & Nini Bull Robsahm / Cast: Henriette Bruusgaard, Jorn-Bjorn Fuller-Gee, Nini Bull Robsahm, Lasse Valdal, Janne Starup Bones, Helge Sween, Jeppe Laursen, Erlend Vetleseter. I like mystery plots, whodunits and complex conspiracy thrillers but sometimes filmmakers take this a little too far. In the case of Norwegian Wrong Turn rip-off Manhunt, the mystery is why the hell any of what’s happening is happening? Inexplicably set in that golden year for teen death, 1974 (so…that tagline should probably be “that year…it was open season” right? ), for no other reason than to rob the characters of cellphones, I suppose, a quartet of teens in a VW Camper drive into the woods for some hiking. They stop at a diner, quarrel about picking up a traumatised young woman, pick her up, argue again, lose their keys and then get ambushed by a trio of backwoods hunters who want to kill them. Why? Shrug. No, really…why? Perhaps the writers thought the true horror lay in the absence of motive but this factor doesn’t impress much when coupled with the less than likeable characters, all of whom have no particular story of their own save for obvious final girl Camilla, who’s going to go to a good school. It’s like I’ve known her forever. 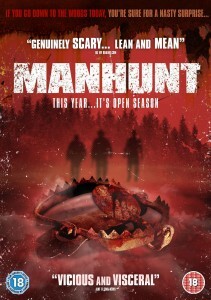 Manhunt does succeed in creating some sub-Haute Tension style, uh… tension when Camilla is wandering alone through the dense forest while her buddies drop like flies. Strangely, she’s the only one who even attempts to fight back and offs all three psychos before staggering away. Notably, the whole film takes place in the daylight for a change, enabling us to witness some amateur pathology and hear some squishy cutting sounds. Ultimately, it’s not a film you’d remember and, even at a mere 76 minutes, seems to drag. Cold Prey it ain’t, Texas Chain Saw it wants to be. …what happened in this movie? REALLY? !